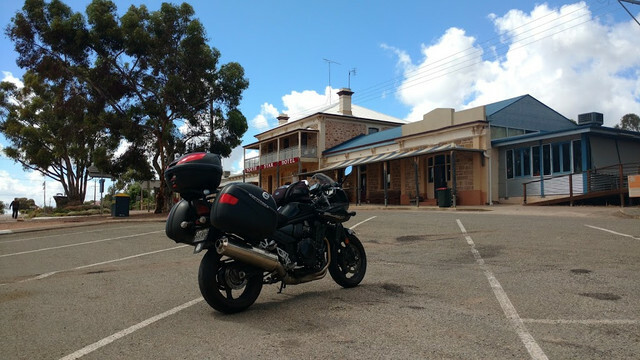 Saturday Morning was a nice early start, paul pulled into the street to join us for the Barossa leg just as madmax and I wheeled the bikes out of the carport, just after 7:00 we were on our way, Dancing Pillion was doing the entire 5 day trip on the back of my bike. We arrived at the gates to find we were there 10 minutes before the park opened, short wait and we were on our 1st stop for the day, dancing pillion walked to the opposite end of the wall where we all had a conversation with her as if her voice was coming from a speaker in the wall. Couldnt have asked for better weather either ...........great ride . @paul wrote: Couldnt have asked for better weather either ...........great ride . 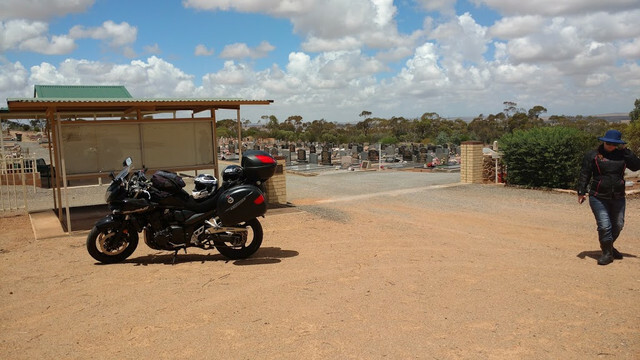 From there we headed into Port Augusta and the Majestic Oasis Appartments for the night, after a scare at reception where my booking had gone missing we managed to secure the last 2 bedroom apartment. When I was parking the bike madmax noticed my rear tyre was down, I headed next door to find it was down to 15psi, I pumped it up, poured water over the tyre as I rotated it but couldn't find anything. Soon after we finally pulled up at David's place, after some re hydrating we were on the way to Pt Lincoln in lovely sunshine. After a nice feed of Fish and Chips, mm, myself and Kaylah headed for Lincoln while David did his rellie visit. I had been looking forward to Kaylah and mm experiencing the spectacular view across Boston Bay for the 1st time as we rode into Pt Lincoln, instead they got grey skies, grey water, rain and only partial visibility across the bay, it was a disappointing entrance to what should have been one of the trip highlights, it wasn't worth going up to Winters Hill lookout either so we headed straight to the Boston Hotel to settle in for the night. Breakfast at a great little cafe (Del Giorno's) on the foreshore that David recommended, great feed and great service for anyone travelling through that way. There was no point in heading up to Winters Hill, the view would have still been crap, I put wet weather pants on, the other 3 didn't bother, I don't think it would have really mattered either way, they got a bit damp at times but it dried out pretty quick too. The ride from Lincoln to Coffin Bay was pleasant enough, crossing between the lagoons just out of Lincoln our visors went from clear to yellow in a split second but there was enough rain to wash them clean again in no time. By the time we left Elliston it was starting to warm up, we turned off the Highway again just before Port Kenny and rode out to Venus Bay, David is more familliar with Venus Bay than me so he took us out to the heads for a look. First thing I did was got rid of the water proofs, I was actually wetter than the others had been from the rain. After Venus Bay we headed back out to the Highway and through Port Kenny and onto our lunch stop at Streaky Bay. The forecast had been for quite a warm day, especially as we headed further North. Lunch stop at the Streaky Bay Hotel, mm and Davo both ordered fish burgers which looked fantastic, Kaylah and I were both still feeling breakfast so decided to go for the "quick" option, toasted ham and cheese sanga's. About 10 min after we sat down out came the burgers, 15 minutes later Kaylah went to enquire about the sandwiches, another 5 or so minutes and the "quick easy meals" arrived well after the others had eaten. We left the pub, rode around to the boat ramp to look back at the town across the bay, it was bloody hot and had started to get a bit "breezy"
Back through town and out onto the highway and we were getting blown around abit, by the time we turned off towards Ceduna we were raelly starting to feel the cross winds. The further we rode, the stronger the wind got, Kaylah said she watched my helmet move at the same time her head did, mm and David noticed the same with their bikes, we rode through dust that was getting thicker and more persistent, twice we had quite low visibility for a few hundred meters each time. 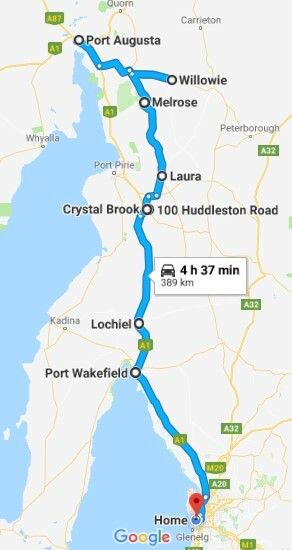 I was starting to feel very fatigued and told Kaylah not only was I not sure if I wanted to take her any further than Ceduna, I wasn't sure I had the energy left either. 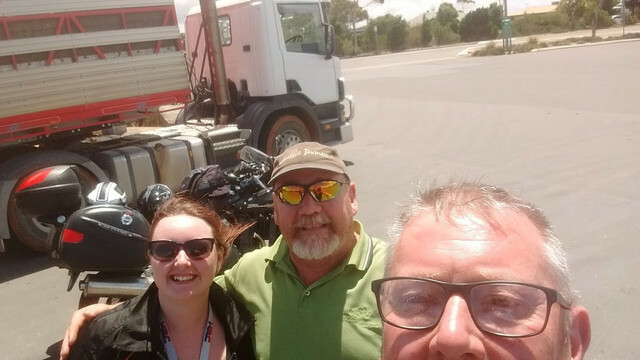 We stopped for fuel at Ceduna, Kaylah walked in and bought us all slushies to try and cool us down, I mentrioned my concerns to Bryan, he suggested we hang out in the restaurant and cool down for a hour or so to see what the weather did. Other motorists were showing us photos and videos which showed conditions much worse that what we'd already ridden in, there were (I suspect some exaggerated) car accidents in the dust, road blocked for over 20min while 4 police cars went through a car on the side of the road. David said if Bryan wanted to continue he'd go with him, Bryan did one outside check and thought it was a bit better, next time he went further from the building, came back in and had decided to stay in Ceduna too, luckily we got the last 3 rooms they had at the pub, as we pulled up the end of the jetty was just visible through the dust. Not that long after we were settled in the wind swung around and blew like hell off the water, a branch came down off a tree landing on the roof of a caravan in the c'van park next door, Davids bike cover turned into a flag flapping off the back of his bike, we were pretty happy not to be out in it. All the ups and downs of a trip to remember . 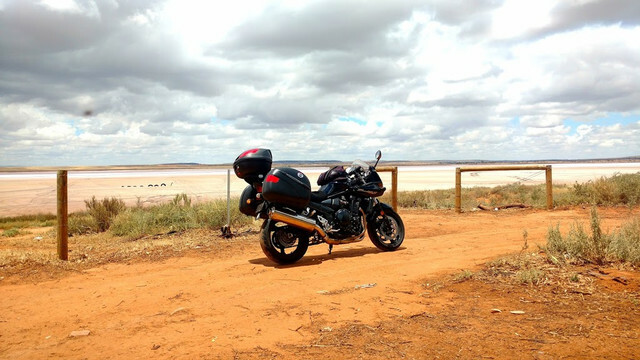 Good write up and nice photos There @Chook looks like the ride was pretty reasonable until Ceduna I;ve been there too with wet weather gear, if there is sun shine and rain on and off you'll be wetter from sweating in the buggers. Its a tough call though as you never know if the rain will persist and conditions cool enough that your body temp will stay reasonable enough not to sweat. So what plug kit did you use for your repair? I've got plugs onboard, but luckily I've never had to use them in anger. Most guys I know don't carry anything other than the crap oem kit under the seat. Not long after breakfast the rest of us said goodbye to Bryan as he headed off on the rest of his West Australian adventure. Kaylah had started to feel unwell and ended up emptying her stomach so we had a very quite start to the day waiting for her to decide if she was going to be ok to sit on the back for 5 or 6 hours. About 10:00 she decided she was ok so we were on our way to our 1st stretch stop in Poochera. It was a pretty uneventful 90 km ride to Wirrulla, soon after though we were starting to wonder what lay ahead, plumes of smoke billowing from what appeared to be something on the highway a few km ahead, as we got within a km or 2 it appeared a truck was on fire so we slowed, as we got close we realised it was a low loader with a heavy excavator using a farmers driveway to reverse up to do a U turn, the smoke appeared to be from a blown turbo, he had a local Ceduna Heavy Vehicle mechanic following him, looks like was either trying to limp back to Wirrulla or Ceduna. 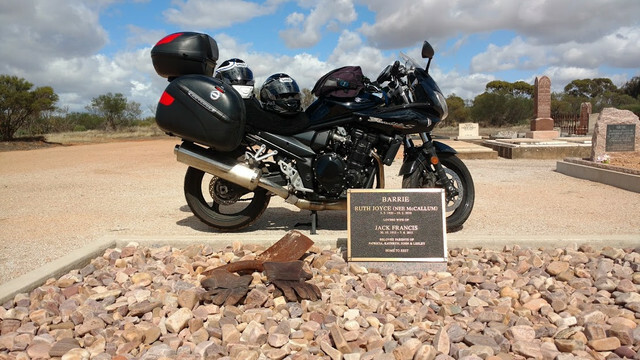 A few more small towns/locations past and we were stopping at Poochera for a stretch, quick stretch and back on the bikes for lunch and refuel stop in Wudinna after a quick photo stop at the Australian Farmer’s Memorial. After a nice lunch we were back on the bikes for the 13 km to Kyancutta when the Eyre Highway turns off to the left towards Kimba, this stretch has no other towns or sidings and is just lots of grazing and cropping land with the occasional massive hill sticking up out of nowhere in the distance. 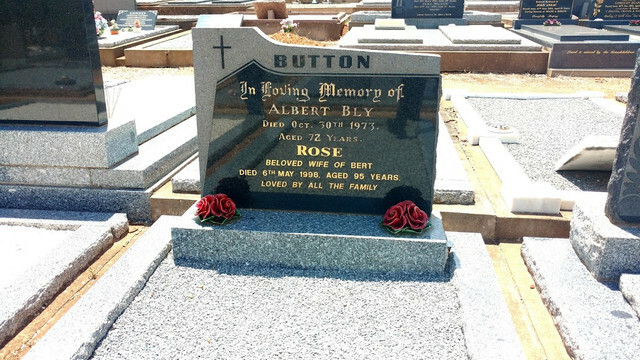 We had considered heading a few km out of town to the White’s Knob Scenic Lookout but what had started off as a mild day was rapidly turning into another quite hot day so we skipped it and headed for David’s turn off to home at Iron Knob. It’s only 90 km but it’s 90km of nothing but scrub, thankfully in the middle of a hot day the Roos had gone to ground, a few months ago I did this stretch in a work car in the early morning at no more than 80kmh, I didn’t go more than 100m without seeing at least 2 – 3 Roos for over a hour. 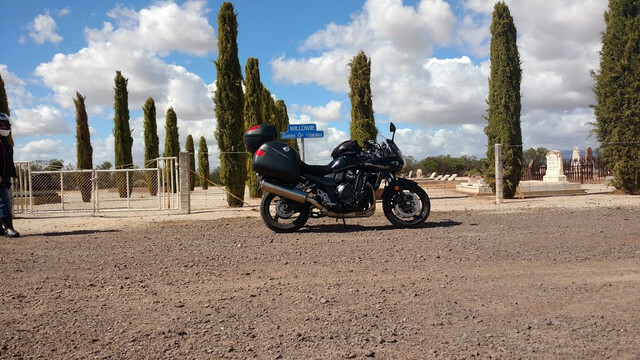 Less than a hour from Kimba and we had pulled off the highway at Iron Knob looking for a small bit of shade to say our farewells. I don’t think the old bloke in the house was too keen on having “bikers” parked out front, he spent most of the 15 minutes we were stopped making sure we weren’t up to no good!! Pretty soon and David was heading towards Whyalla and his own bed, we headed for the Eyre Hwy with a quick photo stop on the edge of town. That all done and we were back on the bike bound for a comfy night at my mate and his wife’s place in Port Augusta, that last 75 km was very hot and we were thankful to ride into the shade of Fred and Eileen’s car port. 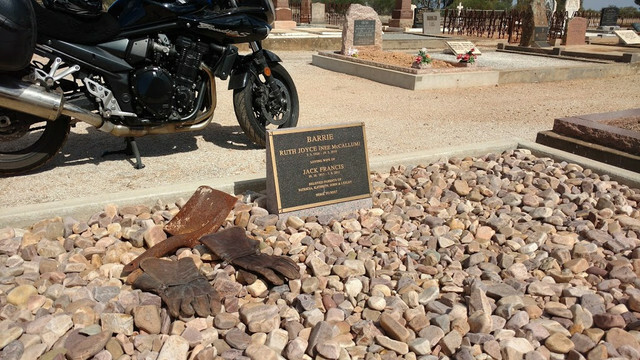 The gauntlets laying on the river rocks were my grandfather's when he rode a Harley and side car in the 1920's and 30's, I was one of 2 grandsons to ride bikes, they only on the road. About a year before he passed he called me over and gave them to me. Kaylah and I took them back for a visit. They actually fit me perfectly and most of the fur is still intact on the inside of the Deer skin.